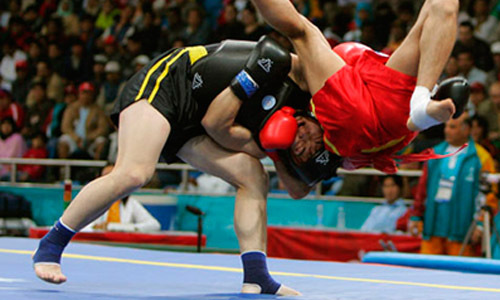 Sanda or Sanshou is a Chinese self-defense system and combat sport. Sanshou is a martial art which was originally developed by the Chinese military based upon the study and practices of traditional Kung Fu and modern combat fighting techniques; it combines full-contact kickboxing, which include close range and rapid successive punches and kicks, with Wrestling, takedowns, throws, sweeps, kick catches and in some competitions even elbow and knee strikes. Not seen as a style itself, rather it is considered as just one of the two components of Chinese martial arts training and is often taught alongside with taolu (forms) training. However, as part of the development of sport wushu by the Chinese government, a standard curriculum for sanshou was developed. It is to this standard curriculum that the term “Sanshou” is usually applied. This curriculum was developed with reference to traditional Chinese martial arts. This general Sanshou curriculum varies in its different forms, as the Chinese government developed a version for civilians for self-defense and as a sport. Sanda appears much like Kickboxing or Muay Thai, but includes many more grappling techniques. Sanda fighting competitions are often held alongside taolu or form competitions. Sanda represents the modern development of Lei Tai contests, but with rules in place to reduce the chance of serious injury. Many Chinese martial art schools teach or work within the rule sets of Sanda, working to incorporate the movements, characteristics, and theory of their style.